Happy New Year and all my very best to you! I’m ending/starting things off on a fun note: A DOUBLE GIVEAWAY! And not just any giveaway, but with my favorite type of polish: GLITTER! Two prizes to be given away. 1) You must be a follower (MANDATORY). In the comments, let me know how you follow my blog and the name you use. 2) In that same comment, give me an email address so I can email you if you are a winner. If the address isn’t valid, I’ll draw another entry. 4) Giveaway is international. WooT! Fresh, new-fallen snow. Living in Orlando, this was a wonderful Christmas gift. I went to Denver to see my family over Christmas and it snowed the evening I got in. Just a cute silvery, dusty blue that has a shimmer. But, I didn’t stop there. The second photo isn’t as good as the first, but I wanted to show that the first one has a glare on it; not a ding. However, I wanted to play with my new Finger Paint flakies some more and I thought this dusty blue was just the right pairing. Even though I did 3 coats of Sally’s Girl, I only did one of ‘Flashy.’ I think another coat would have made the flakes show more. Remember, it is my ring finger, here, that has no flakies on it. Again, just one coat of ‘Twisted.’ I do wish I would have remembered to apply two coats. Sally’s Girl dusty blue is pretty. But if you have ever purchased one of these, you know the bottle is puny, the brush is sub par, and the top sometimes doesn’t stay attached to the brush. If you know these things going in, then you’ll know you get what you pay for, most of the time. I was, most definitely, wanting it for the color. Tomorrow, I’ll show you Sally’s Girl with a different top coat and see how that strikes your fancy. I had a grand time with my family this Christmas. My brother and his family live in Denver. My sister and her husband, my dad and step-mom, and my sister’s daughter and family all came in. We had a house full. A lot of things happened during that week and one of the best things to come out of it…I realized that my sister-in-law is one of my best friends. Did you have a grand Holiday too? Everything is early about this manicure. First, Finger Prints Special Effects Top Coat collection wasn’t supposed to be released until next month. Today I spoke with a Sally’s employee and she said that they got the go ahead from their office to put them out for sale. Lucky us!!! Next thing that is early is that I’m leaving for vacation and this is the manicure I will sport for Christmas. And the last thing that is early is my sincere wish to you all a very Happy Holiday season. OK, this is what I did; I started with China Glaze’s ‘Near Dark’ because I wanted something dark and a creme. I thought that would best showcase the Special Effects. I didn’t want to use just a simple black because I think you’ll see a lot of that look with other bloggers. And, I wanted to, somehow, keep it close to a Christmas/Yule look. ‘Near Dark’ isn’t quite near perfect, however. It was patchy. And even though I thought I got them all, sure enough, out in the sunlight and doing a macro shot, nothing escapes scrutiny! Next, I slapped on those Special Effects. These polishes leave me feeling soooo giddy! I guess I have never purchased so many flakies at once and I’m in overload. Usually, we’ll get one per collection. But an ENTIRE collection!!! I better sit down and fan myself! So I could keep these all straight, I applied them in alphabetically order. (Don’t laugh.) From the thumb over; Asylum, Flashy, Flecked, Molten and Twisted. I posted about the first 4 here, and then today, I picked up ‘Twisted’ to round out the complete set. Taking it from the thumb down: Twisted, Molten, Flecked, Flashy, and Asylum. It’s no secret that my middle finger on my right hand got a serious break. And I’m too stubborn to even them all out. It’s just going to have to catch up. If I had time, these would be fun to matte as well. Even still, these are mesmerizing. It is too bad I’m not taking these lovelies with me. But I am not taking the chance with these at airport security. I got them on as a mani, I’m good to go! Are you getting these? Will you get them all or is there just one or two you want? I really wasn’t looking for anything in particular when I went into CVS but I found some goodies. Looks to be polish that smooths out ridges on the nails. Now that would be a nice effect! Creamy and pastels. Not any that set the world on fire, for me. But I think they are going to be very popular for those that like a more quiet statement with their polishes. These Physician’s Formula creme eyeliners are on clearance. 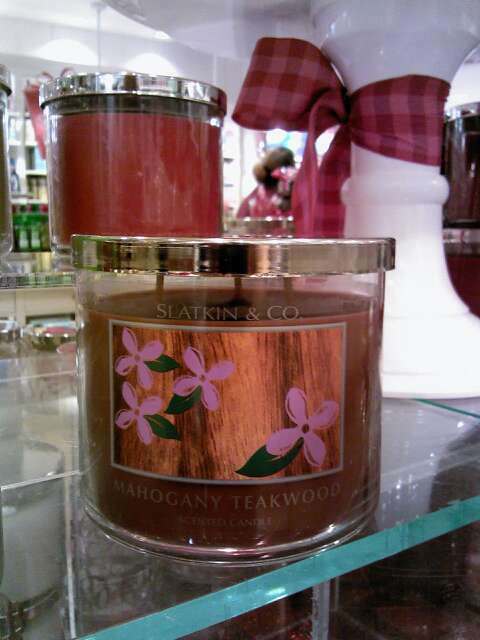 They are normally priced at $10.99 each. They are clearance at $2.75 each. So I saved a total of $32.96. I’m a happy shopper. And, I have to mention, I purchased the green palette first. I loved it and went back for more. These have real staying power. And they are pigmented ‘deluxe’. I highly recommend these! Get in on that savings. 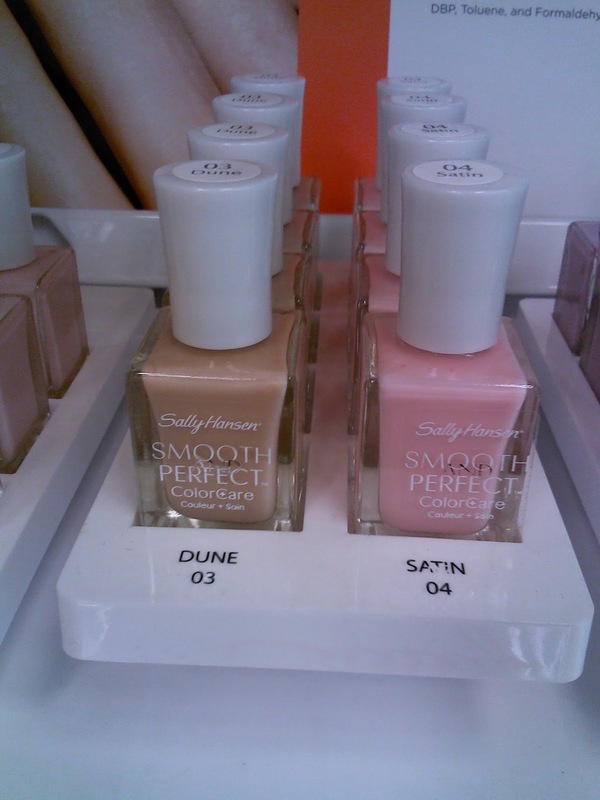 What’s your opinion on the new Sally Hansen bottles? And, yes…I mislabeled these as Essie. They sort of remind me of them. How about you? Finger Paint’s Special Effects Top Coats-FOUND! 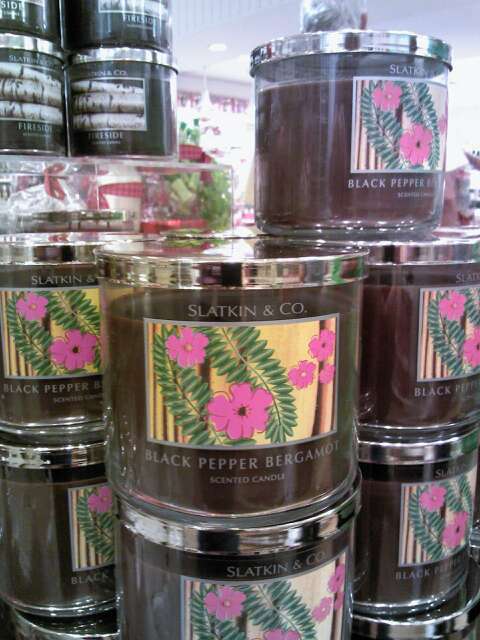 at a Sally’s close by her, I couldn’t sleep! I was up early the next day (dear gawd, and it was a Saturday! ), got my run in, showered, dressed and out the door I went! Here’s the poop…these babies are to be released in January…like, next year, 2012. For some reason, which I didn’t ask because I wanted to get mine first, this particular Sally’s store had made the excellent, and favorable, decision to put them out for sale. Even when I paid for these Finger Paints, the sales woman stated that they were out early and she had to put in another code so the register would ‘take’ it. All I could choke out was ‘Oh!’ I think I was actually having a panic attack getting them because I was afraid some mean Sally’s worker was going to come out of the back room and scream ‘You can’t have those yet! Give ’em back!’ I didn’t feel safe until I got in my car and locked the doors. Then, I took them out of the bag and drooled all over them. To anyone else, they may look the same. But to us, nail polish enthusiasts, do we NOT know better???!!!! This is ‘Flecked’. I’m not even going to pretend I know what this flakie color is. Well, I know it’s WORRRRD!! 1. exhibiting great diversity of elements; heterogeneous (composed of parts of different kinds; having widely dissimilar elements or constituents): a motley crowd. 2. being of different colors combined; parti-colored: a motley flower border. 3. wearing a parti-colored garment: a motley fool. 4. a combination of different colors. 6. the parti-colored garment of a jester. This is ‘Flashy’. I want to say a great, big ‘DUH’ to that one! The last one I have to show is ‘Asylum’. Wow, I’m sufficiently blown away. They didn’t have ‘Twisted’ so I will be looking forward to nabbing that one for the complete collection. And, at the moment, I am working on applying a dark green from China Glaze to show these off. I can hardly wait!!! But I want these to look out of this world!!! In the meantime, if you’d like to see them swatched, click over here to my friend, Nail Polish MD‘s blog and she’ll show you the awesomely over-the-top flaky top coat wonderland. No one else wants these, right???? 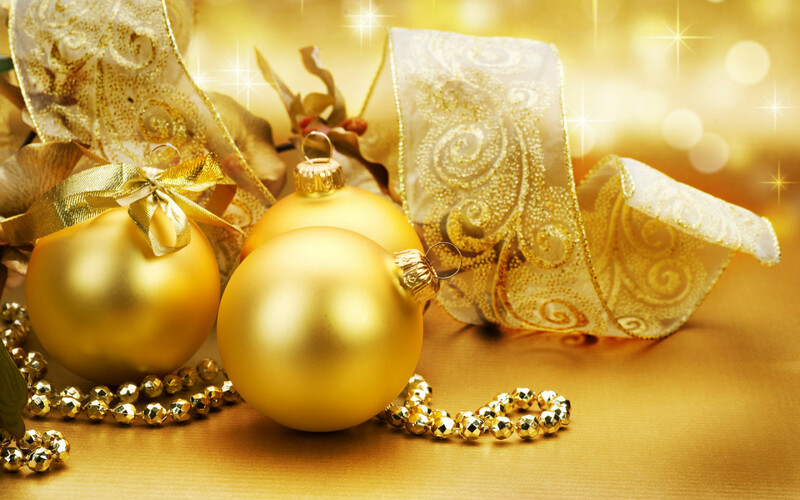 This gold has sparse silver glitter in it; like…bubbles in champagne! Just a bit of an issue with the silver glitter making the polish look, well, bubbly. In person, it isn’t quite this bad, just very noticeable in (my) photos. I applied 3 coats and they didn’t dry as quickly as other polishes do. And so, I nicked my pinky. But the last photo shows just how yellow ‘Champagne Bubbles’ is. This isn’t a gold that usually goes well with my skin tone, but this one, somehow, works very well. No top coat needed. I like to have one glass of champagne a year, but rarely make the attempt to get it. I posted about Verdi and that’s what I enjoy. How about you? Champagne? Gold polish? I have a giveaway going right now for digital scrapbooking software. This is more than your mother/grandmother’s scrapbooking..check out MyMemories.com and see what all you can do with this program. With just a few minutes to spare, I can get in a store, find a deal or something new, snap a photo (yea to my new smart phone!) and be on my way. 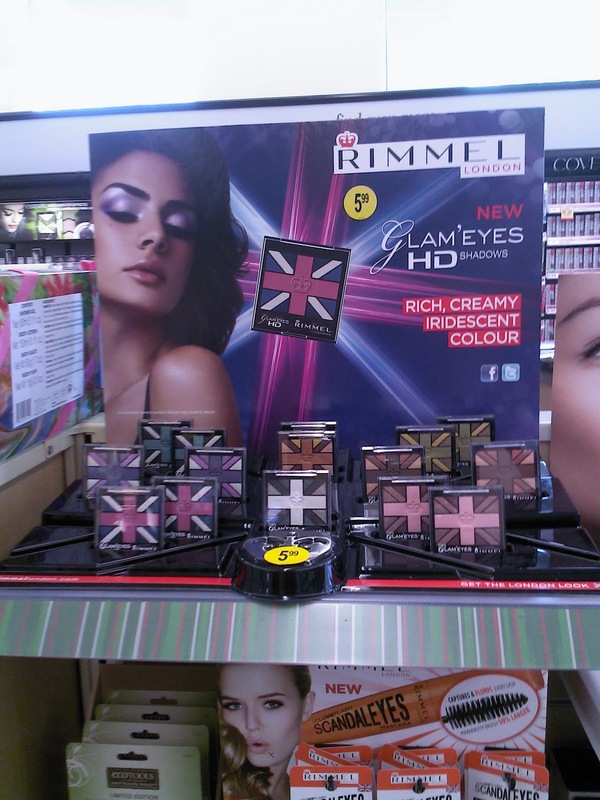 Rimmel has new eye shadows. This is for Glam’eyes HD. 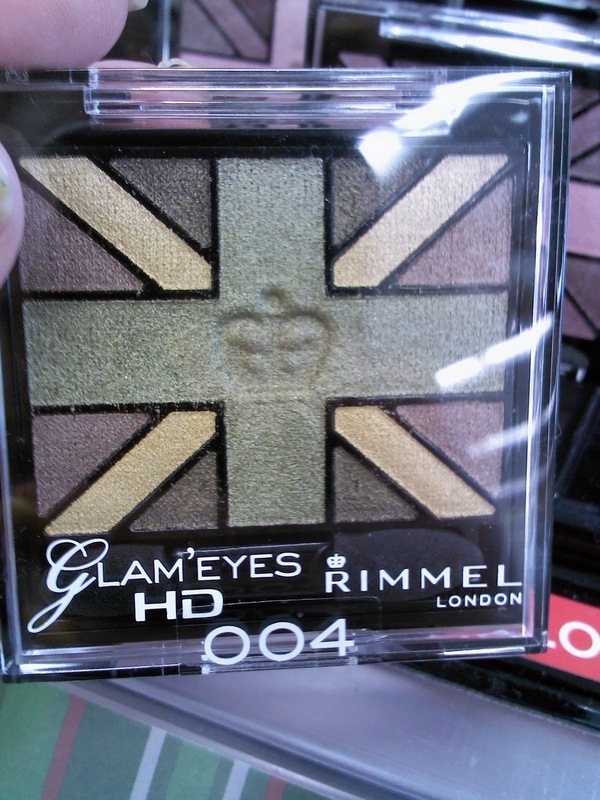 I guess because Rimmel is a British company, they made the design look like the British flag? It is a nice, eye-catching update from their regular palette design. As is often the issue, my camera doesn’t pick up the colors very well. The colors are much more saturated than the photo picks up. The shades in this palette are much more vibrant than this photo shows. They have quite a mixture of crackle looks, lacy, animal, nail art, etc. 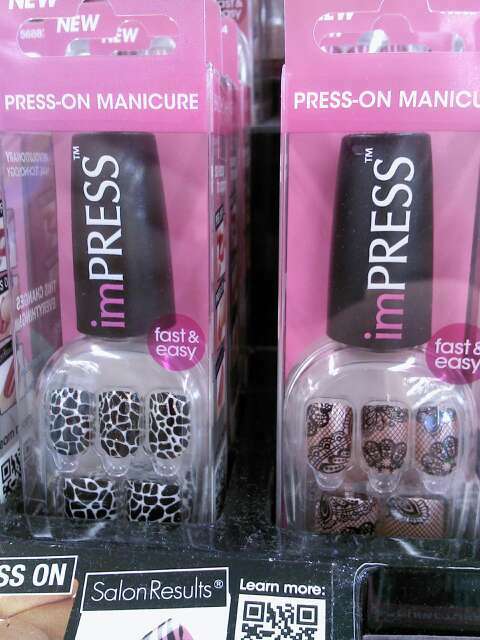 Even though I don’t wear them but rarely, I’m a fan of press-on nails. 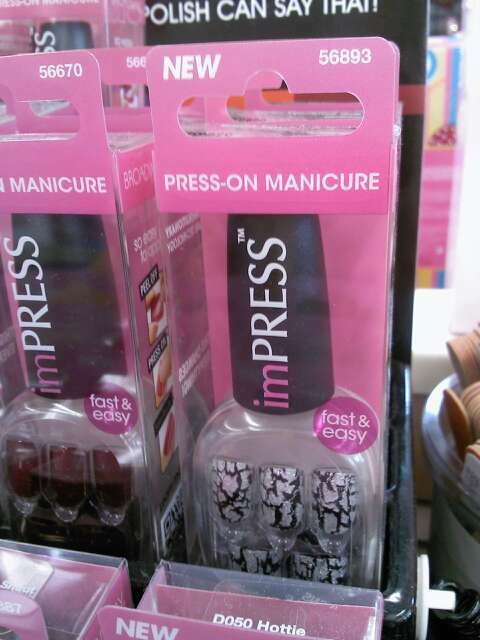 It gives you an instant professional manicured look on the fly. I also saw at the Walgreens that I visited, they had $1 off all Revlon products. There were coupons for this at the cosmetic check out. The coupon says it is only good at Walgreens, and since they were photocopies, I’m confident that you can’t use them anywhere else. 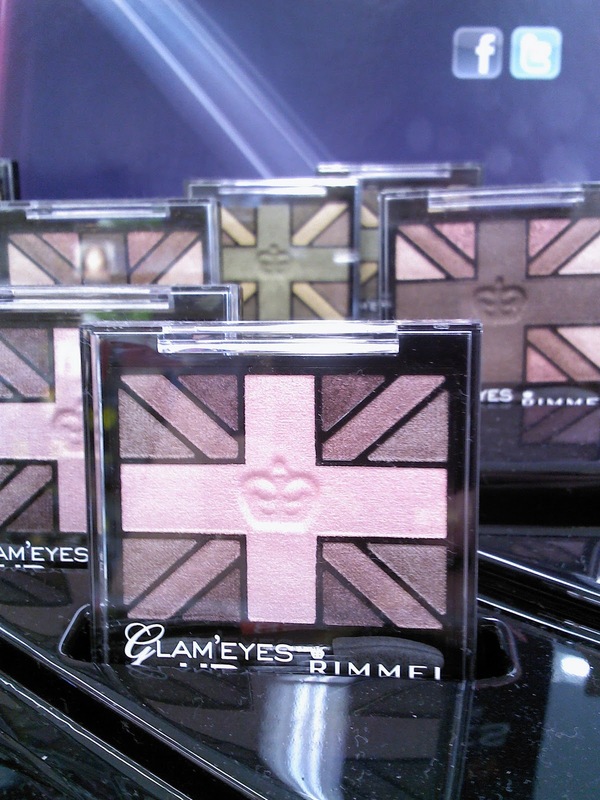 Are you finding any new displays at your Walgreens?